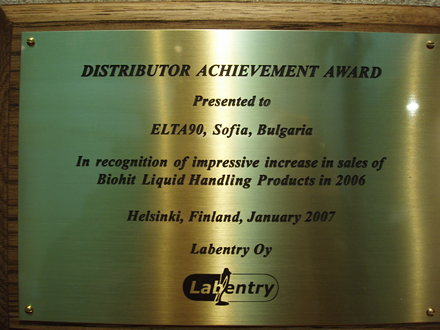 ELTA 90 received its first distributor award for impressive increase in sales of Biohit Liquid Handling products in 2006 among more of 15 companies located in different coutries in central and eastern Europe. 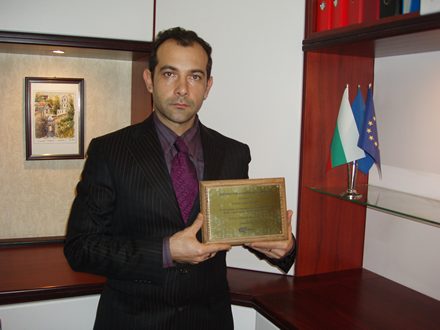 This is an approve of the hard work of ELTA 90 team in establishing in Bulgarian market of the worldwide famous products – Biohit..
Workshop- practical conference: "From classical pathology and morphology to molecules in breast cancer and other solid tumors with innovative products of Illumina, Thermo Fisher Scientific, Abbott Molecular and Nikon". Welcome to our new web site - win 1500 leva! 18 April 2011 - ELTA 90M contribute the competition "Young marksman"
15 February 2010 - European distributor award from SANYO to ELTA 90M Ltd.